Let’s start with the Yocan Magneto, this wax pen vaporizer is known for its no-threading, magnetic attachments. You can say that the Magneto was built for the on-the-go vape enthusiast giving them complete and absolute freedom to vape their favorite concentrates while they’re on their feet. One of Magneto’s strongest suit is its multi-layered ceramic atomizer. Using ceramic atomizers for wax pen vaporizers allows you to experience full-flavored hits without sacrificing your concentrate’s potency and efficacy. Many wax concentrate consumers prefer ceramic atomizers because it facilitates the retention of the unique flavor profiles of your concentrates allowing you to taste the distinct flavor notes and the natural aroma of concentrated cannabis. The multi-layered ceramic atomizer found on the Yocan Magneto pen works as a two-step process. First, the initial ceramic coating melts wax concentrates which heats up your material without burning it – an important feature which allows the Magneto wax pen vaporizer to warm the waxy oil substance without getting to the point of combustion. Think of it as if it’s a fine-tuned heating process which eliminates the negative effects of burnt material like lung irritation which causes coughing and that bitter burnt taste. Next, the second layer of Magneto’s ceramic coating efficiently vaporizes your concentrates which all the more speed up the vaporization process while providing a unique heating environment for your concentrates. With the Yocan Magneto wax pen vaporizer, you’ll never waste concentrates which makes it one of the most cost-effective vaporizers on the market today. 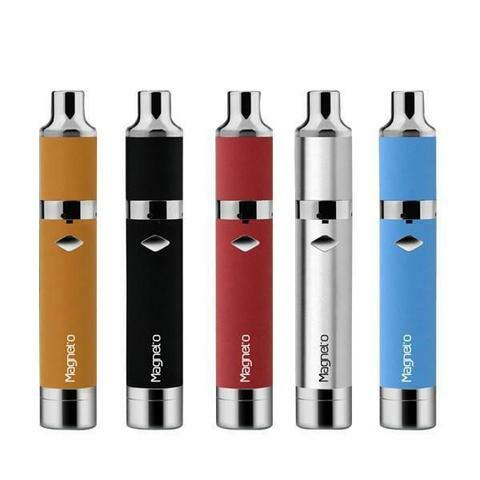 The Yocan Magneto vaporizer makes not only for an inexpensive unit but also a practical vaporizer which will save you money and material in the long run. The Yocan Evolve Plus shares several similarities with the Yocan Magneto. To begin with, the Yocan Evolve Plus wax pen vaporizer is also a travel-friendly vaporizer which can be carried almost anywhere you go. I personally love the Evolve Plus because of its sleek and discreet design and like the Magneto, the Evolve Plus sports a built-in wax jar which allows one to keep extra concentrates even if they vape when they’re out and about. Both vaporizers are made for on-the-go use though one would find that they differ in performance and in vapor production. While the Magneto is known for its subtle and flavorful vapor production, the Yocan Evolve Plus wax vape is known for its lung-ripping vapors. I’ve noticed that the Yocan Evolve Plus is best for people who prefer denser, thicker, heavier clouds that really bust your lungs and could instantly knock you off your socks. Thanks to the Evolve Plus’ dual quartz wax atomizer, you can get almost instantaneous heating in as fast as 15 seconds. The large cloud production of the Evolve Plus is also helped by its dual coils which double the breadth of the clouds generated by the Yocan Evolve Plus. You also won’t have to worry about combustion even if you’re using a highly conductive atomizer since quartz, by nature, is pure. This means that it won’t affect the quality of your concentrates even if your atomizer is exposed to prolonged and extreme temperature levels. These high-performance atomizers are complemented by the powerful 1100mAh batteries which deliver more than the adequate amount of power to the atomizers. One thing that I’ve noticed with the Yocan Evolve Plus wax pen vaporizer is that while it yields impressively lung-expanding clouds of vapors the amount of power it takes away from the battery is significantly low. I was able to squeeze in at the very least 5 to 8 hours of intermittent vaping with the Evolve Plus. I’m surprised that the amount of vapor it produces is exponentially greater than what I expect from just a few short pulses. A 15-second automatic shut-off feature also helps in extending and saving the battery should you be vaping outdoors. Daily dabbers will find that the Yocan Evolve Plus is best for those who want to a vaporizer that looks discreet and stealthy but yields hard-hitting results. Both Yocan vaporizer wax pen is great additions to one’s vaping arsenal. I’d also recommend both for vape newcomers since both vaporizers are easy to use and provides straightforward results without having to require one to learn a new and an unfamiliar vaping style. Apart from being a cost-effective choice, both the Yocan Evolve Plus and the Yocan Magneto allows concentrate consumers (both medical and recreational) to enjoy the benefits of cannabis in an affordable, economical vaporizer.